Do you use the transaction section in your CRM? 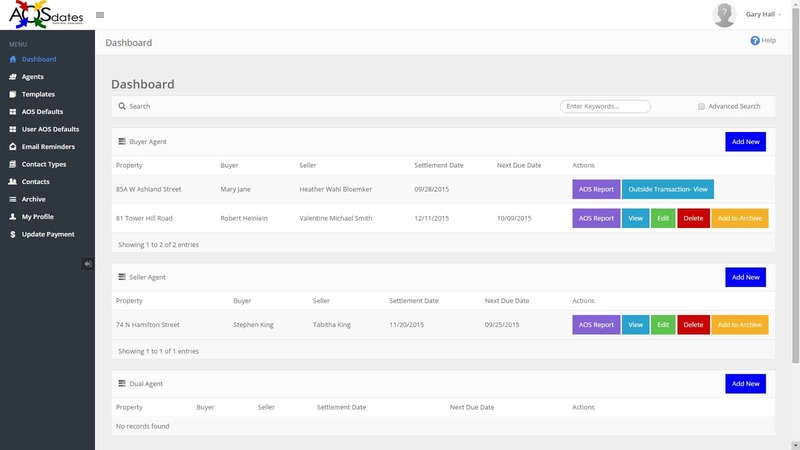 Do you use your CRM for just contact related things, or do you also use the Property/Transaction section? There are many benefits to it so if you don’t already, you should consider using it. It always amazes me how few people do. And far less use transaction management plans. Most people think of these types of plans as being comprised of tasks that their office transaction coordinator or attorney, or title company or you name it, does. But what I mean by these plans encompass all of those tasks that they do, but then all the rest of the things you do as well. You may have different people taking care of a good many things for you, but they certainly don’t do everything. If they did, you would literally have nothing to do after the contract was signed. That said, although they are a major part of the Property/Transaction sections, we’re not going to talk about Transaction Management activity plans. I did that not too long ago. Check out Trans-Plans. You have a tab or section in your CRM with a screen or screens where you track all your contact information, but what about the section that helps you keep track of your listings and closings? Do you use it? Should you be using it? The better CRMs have a section in the Property/Transaction section that helps you track the Parties to the transaction. This is the place where you are able to select a contact record of the person and add them as a party to a transaction. This is one of the great things about this section. If you have any of the following CRMs, they all have a Parties section. Top Producer, IXACTContact, WiseAgent, TribusCRM, AllClients, MyRealEstateTools, MyRedTools, and RealFutureCRM to name a few. As a matter of practice, aside from your past clients, prospects, sphere of influence, etc., you should also have parties affiliated with your past transactions in your CRM. That would include the loan originator/mortgage company, attorney, buyer, seller, home inspector, homeowners insurance company, termite inspector, appraiser, etc. Over the years you’ll end up with a comprehensive database for your area comprised of a significant percentage of those kinds of people and companies. The longer you do it, the less often you’ll have to key in a new one with each new transaction, and the faster and easier it will be to find their phone numbers, e-mail addresses, web sites, etc. Another benefit of having them in your database is that you will be able to see what transactions they participated in and what you thought about them at the time. Did they help, or were they a pain to work with? You should have that in your notes. If you were smart you would have made a note saying they needed to be contacted frequently or they might drop the ball. Or you might have which people were better to deal with in the company and why, or for what aspects of the deal. The normal routine for most agents when they are working on a closing file is to bring out the paper file and look around in the file until they find the affiliated party’s information that they need, if it is even there. Even if it only takes one minute, it’s much longer than having them in the CRMs property/transaction record. And you know full well that sometimes it takes far more than a minute. And you typically have to contact most of them more than once, which means going back to the file and finding them each time. Once you add them as a party to a transaction, they are all right there in one place, just one or two clicks away from calling them or e-mailing them, or getting to their web site. You will save many minutes on each transaction just by having all the different information quickly available in one spot. You can’t imagine how much more you can get done in a shorter period of time when that’s the case. That’s one advantage. Another is that when they are added to the parties tab, they become a permanent part of the record, and in some cases they can be sent out to your client for reference in a report. You can also e-mail all or selected parties all at once, and include documents if necessary. If you’re currently using a CRM, you know how much more quickly you can retrieve information about contacts then you could before. So this is just an extension of that same wonderful efficiency. Check it out! https://garydavidhall.com/wp-content/uploads/2015/02/GDHLogo340.jpg 0 0 Gary David Hall https://garydavidhall.com/wp-content/uploads/2015/02/GDHLogo340.jpg Gary David Hall2013-12-11 21:44:102014-11-04 07:59:44Do you use the transaction section in your CRM? Listing & Closing Checklists for WiseAgent! People have been asking when my “Trans-Plans” Listing & Closing Plans & E-mails/Letters would be ready for Wise Agent. I’m happy to announce that they are ready! The folks at Wise Agent have been working diligently on it and they are now available. You can see the details or purchase them by clicking here. Trans-Plans is an extremely comprehensive set of activity plans/checklists and a set of e-mails/letters that enable you and/or your assistant to stay on top of your listings and closings like a truly organized professional. Regardless of how much help you have, these plans will ensure smoother transactions and higher client satisfaction with everyone always on the same page. If you have been considering trialing WiseAgent I have negotiated an extended trial of 45 days, and if you end up purchasing it though my link, the Trans-Plans E-mails and letters are included as a bonus. Wise Agent now joins a growing list of CRMs that have formatted Trans-Plans to automatically install into their program. Feeel free to call and see what they look like and how they work in your CRM! https://garydavidhall.com/wp-content/uploads/2015/02/GDHLogo340.jpg 0 0 Gary David Hall https://garydavidhall.com/wp-content/uploads/2015/02/GDHLogo340.jpg Gary David Hall2013-07-10 09:05:552015-01-29 13:49:53Listing & Closing Checklists for WiseAgent! There is usually no shortage of phone calls and questions coming from the client just prior to closing. Two things I always tried to accomplish throughout my transactions was to keep the client informed, and to reduce time consuming/unneccessary phone calls to a minimum by doing so. I used a Buyer Preparation Email or letter to accomplish this. Following is an e-mail/letter that is in my Trans-Plans Listing and Closing Plans. I would send this out about ten days to two weeks prior to closing/settlement. It’s a template e-mail and like all template e-mails, it can’t be perfect for everyone’s personality and market. But it’s a good start that you can use after you tweak it! Just remove what is not applicable to you and your market, and it should also give you some ideas about what to add that is missing for you. Settlement day is almost here! I’m sending this e-mail to recap some details I’ve brought up throughout the process, just in case I missed something, or you’ve forgotten something. Following is a list of things you must accomplish prior to and on settlement/closing day. Remember – settlement/closing day is a legal proceeding. The following items, if not accomplished, CAN prevent settlement/closing from occurring on time. 1) Remember to bring your drivers license or some type of official photo I.D. to the settlement/closing table with you. 2) You must have a “Bank” or “Cashiers” check made payable to your title company. I will call you 3-5 days prior to settlement with the amount you need to bring. 4) You should have a one year PAID homeowners insurance policy by now. A copy of the “Declaration” page should be faxed to the mortgage company. 5) Some people have asked me in the past if they needed to be “dressed up”, for settlement. Absolutely not! Most people have been and will be moving and getting dirty. Wear whatever you like within reason. 6) If you have not already, you will receive a written notice of the time, date, and location of settlement/closing. I will have discussed this with you by now. 7) Before settlement/closing, you will do a “Pre-settlement Inspection” at which time you will be checking the home to make sure all the systems are still functional. You will be doing things like opening windows, flushing toilets, checking water pressure and temperature, checking the heat and air conditioning, etc. There is a good likelihood the sellers will not be there. There will be plenty of time to talk to the sellers during settlement/closing, to learn about the idiosyncrasies of your new home and neighborhood. 8) Sometimes, due to prior settlements/closings running overtime, there are delays. Please anticipate that possibility. Settlement should take approximately 60 to 90 minutes once it starts. Sometimes there are temporary issues that will extend that time. This is not common but it is not unusual either. If something unforeseen comes up, I will deal with it. That’s why I’m there. 9) Make sure all your utilities/services have been turned off where you live now, but make sure they stay on through the day of settlement. Make sure you have started your utilities/services at your new home as of the day of settlement/closing if that is when you intend to move in. To include: Electric, phone, mail, trash, cable T.V., water, and sewer(sometimes our office will initiate water/sewer if you cannot). 10) CRITICAL! Everyone that is on the mortgage must be at the settlement/closing table if prior arrangements have not been made! Please feel free to call with any questions you may have about anything at all. And please know that it’s normal to be nervous, so that’s OK. I’m here for you! Tran-Plans now available for IXACTContact! https://garydavidhall.com/wp-content/uploads/2015/02/GDHLogo340.jpg 0 0 Gary David Hall https://garydavidhall.com/wp-content/uploads/2015/02/GDHLogo340.jpg Gary David Hall2011-10-03 14:59:592014-06-05 15:01:53Tran-Plans now available for IXACTContact! What do Top Producer, Agent Office, Active Agent, AdvantageXi, IXACTContact & WiseAgent have in common? If you have one of these programs, are you using the Activity Plans capability? Most people are familiar with using plans to automatically follow up with prospects, or to follow up with clients after closing, but what about in between? What will Real Estate Transaction Management Trans-Plans do for you? Significantly reduce the time necessary to train a new assistant, or give your assistant a comprehensive list of their responsibilities. One that you can track! If you have a team, everyone is assigned their individual tasks, which appear on their calendar – not yours! “I would like to offer a non-solicited plug for Gary’s ‘Real Estate Transaction Management Trans Plans’ action plans that he sells on his web site. I purchased them several months ago, and have modified them to my way of doing business. I feel without his plans, I would not have been able to keep up my current production of 40+ transaction sides with no assistant. https://garydavidhall.com/wp-content/uploads/2015/02/GDHLogo340.jpg 0 0 Gary David Hall https://garydavidhall.com/wp-content/uploads/2015/02/GDHLogo340.jpg Gary David Hall2010-03-02 12:30:052014-06-06 12:30:26What do Top Producer, Agent Office, Active Agent, AdvantageXi, IXACTContact & WiseAgent have in common? Been planning to implement workflows, but just can’t get the time? You can finally implement the plans and e-mails/letters that keep you on track during listings and closings, instead of just wishing you could get to it. If you have Top Producer, Agent Office, Active Agent for Outlook, or AdvantageXi, Trans-Plans are included and will be installed as a starting point, saving time. If not, we simply start from scratch with whatever CRM you use, using the plans as a written template. I will consult free online to see what can be done to organize you with your CRM if it is other than the above listed ones. INCLUDED – ‘Trans-Plans’ – Activity Plans & Letters Package! This is not a class you attend to learn how to implement activity plans. This is 100% live one-on-one implementation on-line or on-site! https://garydavidhall.com/wp-content/uploads/2015/02/GDHLogo340.jpg 0 0 Gary David Hall https://garydavidhall.com/wp-content/uploads/2015/02/GDHLogo340.jpg Gary David Hall2010-03-02 12:16:372015-07-22 16:06:25Been planning to implement workflows, but just can't get the time? As you hopefully know, I am a reseller Top Producer 8i, Agent Office, Active Agent for Outlook, and many other Contact Management/CRM solutions,and a trainer for Agent Office. Just in case you are unaware, I am also the guy that created Trans-Plans. Trans-Plans are available for Top Producer, Agent Office, and Active Agent for Outlook. ‘In Agent Office and Active Agent for Outlook, they are called Activity Plans’. In Top Producer 7i they are called ‘Action Plans’. These plans and letters import into the program you’re using, and included in the plans are drip mail/email campaigns to thank referrers, keep your clients informed and therefore calmed down, always asking for referrals at the same time. What will Trans-Plans do for you? “I would like to offer a non-solicited plug for Gary’s ‘Trans Plans’ action plans that he sells on his web site. I purchased them several months ago, and have been slowly modifying them to my way of doing business. I feel without his plans, I would not have been able to keep up my current 2007 production of 40+ transaction sides with no assistant. …Finally I broke down and took a class from Gary David Hall. WOW! That was money Well Spent! Gary knows his programs and is a good teacher. I learned a whole lot and was able to put it to good use. …Another point: Listing Plans come with the program. Gary Hall wrote a set called Trans-Plans. They are VERY Thorough. I was surprised at some of the things he came up with to remind me to do. Some are not relevant to my practice but most are and it is very easy to delete the ones you don’t need. Has anyone yet used the Trans-Plans for Top Producer? Are their any recommendations for this? It sounds great but $200 is a large investment? I would like to see recommendations first. Amy – I use these action plans in Agent Office – same plans. They are great action plans because they are so complete. There are a couple of big challenges with any contact management program and the biggest one, imnho, is the follow-up action plans. First, you have to create them, then you have to launch them and use them, and then you have to update them (or do you???). We had more than 100 action plans in our system before these came along. We can’t delete the old action plans because of how the system works, however, we use these new plans now, customized to our business which is now at 7 on our team, on the way to 9 before the end of the year. Before these action plans came along, we were actually at the point where we were going to bring in the creator of TransPlans (Gary David Hall) for a couple of days to re-write all of our plans. There are not a lot of options out there for this type of action plan, and these are very good and definitely worth the small cost. One of my other posts about combining activities in plans, prompted me to expand on that topic and go a little further. The result is the following post. Some of it is a repeat, but most is not. There are a fair number of ‘Agent Productivity’ software programs and services available that enable the user to create ‘Activity Plans’, or ‘Campaigns’. These Plans have several tremendous benefits, and if you are using one of those programs (listed below), and you have not yet seriously looked into using the activity plan capability in them, you are missing out on an incredibly valuable tool that you already own. For those of you that are using, or plan to use them, the following information will help in the development of them. I created ‘Activity Plans’ in Real Estate specific software when I was an agent, when the software became available in 1989, when we were all still using DOS! Since 1996, I’ve worked with many agents/teams around the country expanding/developing ‘Activity Plans’ in Agent Office and a few in ‘Top Producer’. I have witnessed, through first hand use, and through my clients, the value in using them. In this article, we are going to focus on Listing & Sales Transaction Management. At least as important, is using activity plans to get business. Lead generation and follow-up plans. A good deal of this article applies to them as well. What are the benefits to using them? Some of the Real Estate specific tools available with which to use them are; Agent Office, Top Producer, Active Agent for Outlook, Respond, REST, 360 Agent, and Goldmine (with the Real Estate Specific add-on). In all of these programs, the user can add a task to their calendar one at a time. Most licensees sit down when they get a listing, and do just that, and it takes a significant amount of time. Because it does, only a small percentage of the tasks that are actually performed during the process, will make it to the calendar. Using activity plans, you create a ‘template’ group of tasks, which can be assigned to a contact, or subject property, all at once, and they will appear on your calendar, on the dates when you need to accomplish them. By tasks, I mean things such as; Enter into MLS; Write thank you note; Introduction call from assistant; Change contact category to ‘Seller-Active’; Obtain association docs, Mail ‘Client Listing Report’ etc. 1) Far and away the biggest benefit is the reduction of stress you will see in your business life. Why? Why is this business so stressful? Did you ever sit down and really evaluate why it is? There are a myriad of tasks involved in getting a home sold, and then taking it to settlement. What is one of, if not the biggest reason for your stress, is that you have those hundreds and hundreds of details constantly floating around in your head. When you are in the middle of the listing, or the sale, where are those tasks? They, and the resulting need for decisions about when to accomplish them, are bouncing around in your head. Tasks + Decisions = Stress! Having an automated to-do list for all your transactions takes all of the repetitive tasks out of your head, and puts them on your calendar, on the day that you need to do them! Because you decided once, when you created the plan, when you want to do the tasks, the number of decisions you have to make are also reduced tremendously. Things no longer fall through the cracks. Your mind is more clear and less stressed, and you literally do away with dozens of decisions every day. It is not possible to appreciate how much of a difference this makes, until you do it! It’s like telling a seller how complicated Real Estate is. They can’t comprehend it until they do it. Even if you have someone doing your transaction management, how much do they do? They don’t do everything you need to accomplish throughout your listing, or your side of the sales transaction. 2) I know some of you are sitting there thinking, ‘I use comprehensive lists!!! No detail should be on a paper list. Paper lists can only be in one file, or on one desk, at a time. Those same details, when in ‘the plan’, can be viewed by anyone at any time, without having to waste time locating it. No more – “OK, who has the Oak Lane file? No more walking to someone else’s desk or file cabinet. No more need for sticky notes, voice mails, etc. One of the goals with activity plans is to have every single detail (to-do, letter, call) in the plan, anticipating the day when you either hire an assistant, or have to replace one. Every detail that is ‘in someone’s head’ becomes a potentially overlooked detail, a liability, and part of a learning curve, for the new assistant, or replacement. This translates to a loss of time to you, in that you have to communicate that detail to the new assistant, and/or do the backpedaling for them, because they missed it. No activity plan can hope to take every detail into account. Every transaction is unique. That said, a good activity plan can take the vast majority of the transaction’s details into account, as the vast majority of transactions are the same to agreat extent for almost every transaction. More often than not, the assistant takes care of the plan items, and the agent takes care of the unique items. 3) Speaking of assistants; if you have an assistant – how long did it take to train them? How many hours did you lose in productive listing and selling time? What if they quit next month? You have to start all over again. If you have activity plans in place, their transition and learning curve will be a very small percentage of what you just went through. I was with a client the other day that proudly displayed his ‘Operations Manual’, which was what his assistant was supposed to use to do their job. If you’ve ever written an ‘Operations Manual’ you know that the day after you get it done, it’s well on it’s way to becoming obsolete. Some of the above mentioned software programs enable you to have ‘Notes’ in each task, which you can use to describe click-by-click, how to edit the letter for that activity; how to print the report in that activity; what that activity is telling them to do, why they are doing that activity, and so on. They can be used as a “Dynamic Operations Manual”. This eliminates a tremendous amount of training time. The difference is that with a paper operations manual, it inevitably becomes useless, because it is not kept current. Using the activity plans, and the notes in the activities, means you can edit/change/update that particular activity on the fly, and it’s automatically incorporated into any future ‘launch’ of that plan. It’s extremely easy, and therefore likely, that the plans will be kept up to date. 4) If the licensee wants to walk out of the office and review the progress of a transaction, it can be printed out, and every detail is in the report. Nothing is in anyone’s head. Nothing is on a separate paper list. 5) If you do not have an assistant, and you ask someone to step in for you for a day, 2, or more; everything is there. All in one place. https://garydavidhall.com/wp-content/uploads/2015/02/GDHLogo340.jpg 0 0 Gary David Hall https://garydavidhall.com/wp-content/uploads/2015/02/GDHLogo340.jpg Gary David Hall2006-09-15 14:54:012015-07-22 16:07:12"Stressed out? Get Organized with WorkFlows"